I apologize for the subject line. 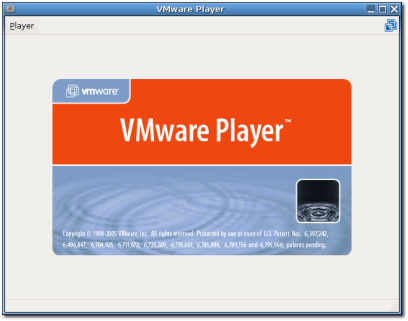 VMware announced today at VMworld 2005 the VMware Player for Windows and Linux. 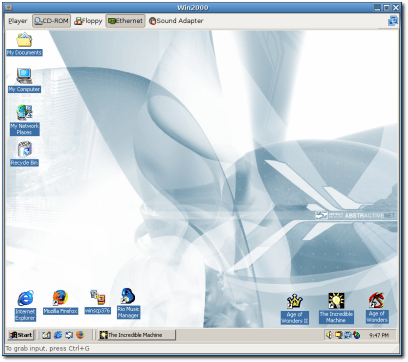 It’s a free program that allows users to use VMs without needing to purchase Workstation. It’s not a substitute for Workstation, as it won’t allow you to create or modify VMs or to snapshot them, but it’s still very useful. You can download VMs that others have created, such as from our collection of VMs on VMTN. The Linux version of the Player was written mainly by Philip Langdale. He talks a bit more about it in his blog. Included below are a couple of screenshots of the Player in action. Updated: The Win2K thumbnail now actually points to the Win2K screenshot. Hey, look! The Incredible Machine! Update 2: If you tried posting a comment on my blog, but had trouble, try again. It should all be sorted out now. Are these you screenshots ??? I have read somewhere (planet.gnome.org? don’t remember) that it is a bit hard to install, mainly on BSD-init distros. Well, this is just to inform you, and all the other peaple who want to try, that I works perfectly on my Slackware :). I had only to create a “fake” man directory in the dir tree upacked from the tarball, or the install script would stop (that, and also the standard /etc/rc.d/init.d, rc0.d… stuff).